Sitting rink-side at an NHL game may sound glamorous, but it comes with its fair share of hazards. 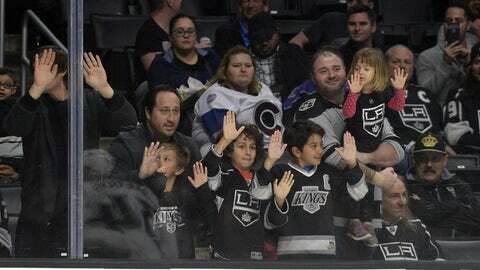 Ivana Surovcova learned that unfortunate lesson at the Los Angeles Kings game against the Colorado Avalanche. Yahoo Sports has an interesting story about the accident Surovcova suffered. She happens to be the girlfriend of Marian Gaborik, who seems to have picked a partner with a great sense of humor. She was sitting in a section near the Los Angeles bench, and was hit in the face when a puck deflected into the crowd during the shutout against Colorado. She suffered a cut by her left eye, and Gaborik later tweeted out a picture of her sporting the gash with some very kind words about his significant other, who is a professional dancer from Slovakia. It looks like a badge of honor she proudly wears in support of her boyfriend, who scored just 47 seconds into that game. Maybe this will further propel Gaborik into more scoring flurries. He has just 13 points in 29 games this season, but is in the midst of a 4 game point streak. Coincidentally, the Kings are on a 4 game winning streak. There seems to be a strong correlation here: the Kings have a greater chance at winning when Gaborik plays well. Imagine that. It’s a lighthearted moment because she wasn’t badly hurt, but it’s important to remember that flying pucks are extremely dangerous. The Brittanie Cecil death back in March of 2002 was absolutely horrific. She attended a Columbus Blue Jackets game and later died from injuries sustained when a puck shot by Espen Knutsen was deflected into the crowd off Derek Morris’ stick and hit her on the head. The league responded by putting mandatory netting above the glass at both ends of the ice, which just seems like common sense at this point. We’re all extremely thankful that a tragedy was avoided this time, and Surovcova seems to be taking it all in stride. She and Gaborik now have another interesting story to tell their friends, and if the Kings end up going on a magical playoff run later this season, maybe this will become a part of franchise lore.